Transport for London (TfL) announced that it will be making a series of changes to its London routes. One of the main changes is the withdrawal of the RV1 route, which operates eight hydrogen fuel cell vehicles, two of which are Van Hool A330 models. 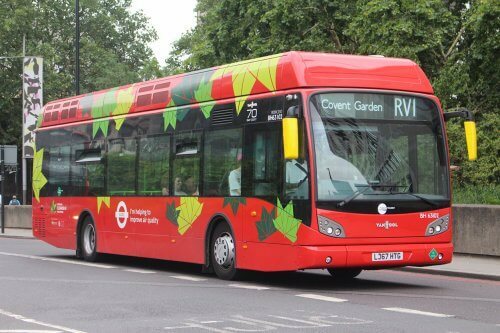 Geoff Hobbs, Director of Public Transport Service Planning at TfL, told CBW: “The RV1 is one of central London’s emptiest routes. Fewer people are using it than ever before with the average bus having just eight people on it. Withdrawing this route, while at the same time enhancing the 343, ensures the area remains well served by public transport as we free up resources for the growth of outer London’s bus service. TfL also confirmed that it has plans to reduce its central bus network, after a review of demand in the centre of the capital showed a drop of 12% in three years. This will allow for increased services in outer London. The decision to reallocate resources will be supplemented by additional funding to speed up investment in outer London. Consultation over a new bus route at Kidbrooke is ongoing, but plans will now be brought forward after extra funding. The new route will be the 335, which will connect new homes in Kidbrooke to a key transport hub at North Greenwich. TfL has also decided to make alterations to routes 11, 19 and 22, while the addition of the 311 route will not be going ahead. The withdrawal of the 271 route has been abandoned. Amendments will be made to routes 171, 388 and 476 to enable better interchanges. Geoff Hobbs, TfL’s Director of Public Transport Service Planning, said: “London and the way people travel is always changing, but our bus network historically hasn’t always adapted to this. Parts of our network have become inefficient and unreliable, with too many buses in the same places causing problems with congestion. “We will tackle these inefficient central London pinch points and free up resources to allow for the growth of outer London’s bus service with these changes, which are predominately minor route restructures or timetable adjustments. GLA (Greater London Authority) figures show that if no action is taken to reduce congestion by 2041, three days would be lost per person every year on London’s roads, and an additional 50,000 hours would be lost to slower bus speeds in peak times.